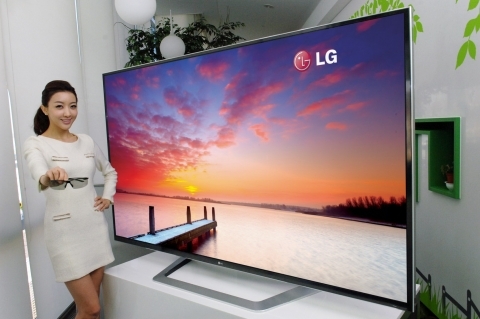 LG Electronics (LG) will unveil the world’s largest 3D Ultra Definition (UD) TV at the Consumer Electronics Show (CES) in Las Vegas. SEOUL--(Korea Newswire) December 29, 2011 -- LG Electronics (LG) will unveil the world’s largest 3D Ultra Definition (UD) TV at the Consumer Electronics Show (CES) in Las Vegas. By combining LG’s industry-leading 3D technology and Smart TV function with UD display technology, the 84-inch TV breaks new ground in immersive 3D home entertainment. LG’s 3D UD TV boasts superb picture quality with 8 million pixels, four times the resolution clarity (3840x2160) of existing Full HD TV panels. Combined with LG’s Slim and Narrow Bezel Design, the 3D UD TV provides the most convincing 3D viewing experience currently available outside of a movie theater. What’s more, 3D Depth Control allows users to customize their viewing experience by controlling the 3D effect while 3D Sound Zooming provides users with 3D sound that rivals the output of all but the best home theater systems. Via the superior display panel, users can access LG’s Smart TV ecosystem, which comprises over 1,200 apps and gives users access to a growing range of premium content services such as the 3D Zone where viewers can select from a wealth of 3D movies. The imbedded 2D to 3D conversion engine expands the availability of 3D content to limitless levels. Users can easily browse and navigate the Smart TV ecosystem using LG’s new, ergonomically-designed Magic Remote which now recognizes four different types of command input: Voice Recognition, Wheel, Magic Gesture and Point.